Cottontails Baby: Meet Roger the hound! I have spent the day writing descriptions for all my new Moulin Roty toys and uploading them on to the website. Slight frustration in that I can't add images at the moment - just a little blip and I'm sure my web designer will sort it out in the next couple of hours - but on the whole it's been a lovely day, working through the new toys one at a time, sitting them on the desk in front of me and writing little descriptions. I think my favourite might be Roger the hound. He is so soft and quirky, I just love him. (He is sitting on my lap as I type, peering over the keyboard!) 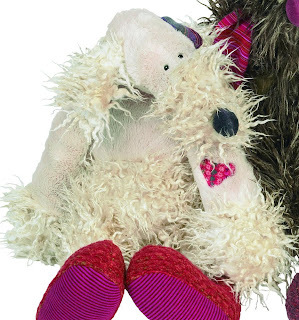 His fur is the same as Lola bunny's, and he has a little patch on his arm in the same fabric as Nini mouse's dress (I love spotting the themes between the toys) but he a creature all of his own with his lovely long snout and crazy dangly limbs. I have other favourites too but I'll put them into a different post. I feel Roger deserves this one to himself. oh he's so cute but a little out of my price range at the mo boo hoo! Sorry it's been a while again, things here have been crazy and we've moved in to our new house and still have boxes everywhere argh! I've popped you on to my favourtire shops list on my blog and will try and get you on to my website. Hope this helps sweetie.